An easy to assemble planter box that fits between the posts of your 10 x 10 or 12 x 12 pergola, helping to differentiate spaces. Your pergola planter makes it simple to add beautiful garden elements to any patio. Add plants to attract butterflies, detract mosquitos, create privacy, add colour, or easily grow vegetables close at hand. The Pergola Planters come in 2 sizes: to fit 10 x 10 pergolas (110 in) or 12 x 12 pergolas (134 in). The planter is also maintenance free and features a 20 year warranty. Spring or Fall, weve got your plants covered. Get your tender seedlings off to a healthy start as early as possible so your plants will be larger and hardier. Grow cold-tolerant crops like lettuce, kale, green onions and radishes well into the winter months. The Frame It All Extendable Cold Frame Greenhouse measures 4ft. x 4ft. and stands 36in. high at its peak. Multiple units can be zippered together end-to-end, to create a continuous row of coverage. The zippered windows allow easy access for tending to your plants, and controlling temperature and humidity. The powder-coated steel frame will not rust or corrode, and the heavy-duty PVC cover will stand up to heavy wind or inclement weather. Connects directly to any Frame It All raised garden bed, sold seperately. When used in conjunction with Frame It All Raised Beds you can increase your soil temperature even further. This Gazebo Penguin<sup></sup> 3-season gazebo is perfect for entertaining your family and friends outdoors. The shelter also works well as a cabana by the pool, a card room or as a sitting room (cool by day too, thanks to ultraviolet shielding in the roof). Need more options? The gazebo even works as a bedroom on muggy nights. 12 ft. Pergola Garden Bed An easy to assemble planter box that fits between the posts of your 10 x 10 or 12 x 12 pergola, helping to differentiate spaces. 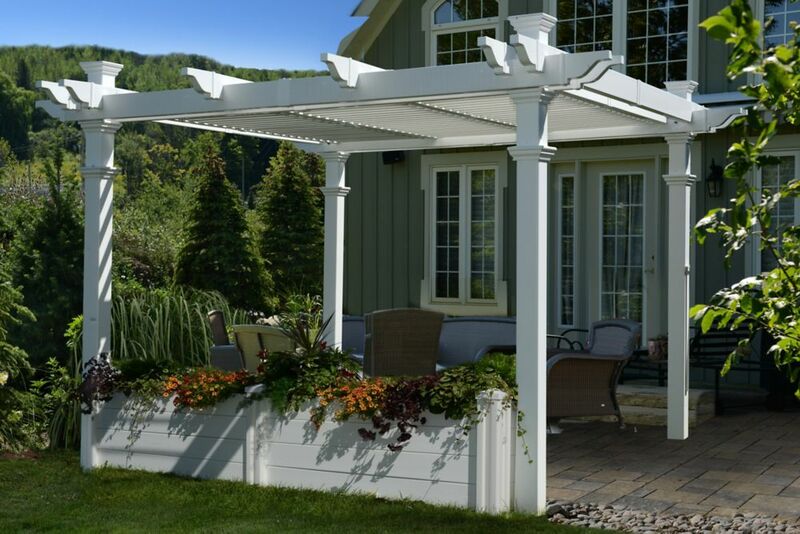 Your pergola planter makes it simple to add beautiful garden elements to any patio. Add plants to attract butterflies, detract mosquitos, create privacy, add colour, or easily grow vegetables close at hand. The Pergola Planters come in 2 sizes: to fit 10 x 10 pergolas (110 in) or 12 x 12 pergolas (134 in). The planter is also maintenance free and features a 20 year warranty. 12 ft. Pergola Garden Bed is rated 4.0 out of 5 by 1. Rated 4 out of 5 by Ann from There are no trays for the bottom so I need... There are no trays for the bottom so I need to find some as this planter is set up on a concrete pad. Assembly was ok, a bit ackward with one person suggest a partner to help. Good quality materials. WHAT IS THIS MADE OF ? EASY TO PUT TOGETHER ? SIE 12 X 12 ? This is a vinyl garden bed that goes between the posts of pergola that is sold separately. How would you recommend bracing this down since it only weighs 55lbs (I assume it is in lbs)? or would the planter be enough to weigh it down in heavy winds? This is only the garden bed the pergola is sold separately. This is only 2 feet and an inch height (as it says under specification), is that correct?